This is the second part of a look at million dollar pianos in the news. And I am indebted to Amy from the Piano Pantry blogsite for bringing to my attention a new exhibition at the Clark Art Institute in Williamstown, Massachusetts. The exhibition is entitled “Orchestrating Elegance”, and features the work of 19th century British painter Sir Lawrence Alma-Tadema. It offers the chance to see “the grandest grand of them all” in its original context. Railroad and insurance tycoon Henry Gurdon Marquand commissioned the painter to design the music room for his New York mansion at the end of the 19th century. At that time, the music room was the social hub of all great houses. And this exhibition reunites twelve of the original nineteen pieces of furniture from the room along with various paintings, ceramics, textiles and sculptures. Marquand, one of the founders of the Metropolitan Museum of Art, gave Alma-Tadema unlimited funds for the project. There was no budget. To say that the music room was lavishly adorned would be something of an understatement. The room was created in a “Greco-Roman” style, and its contents were exquisitely crafted with a fanatical attention to detail. 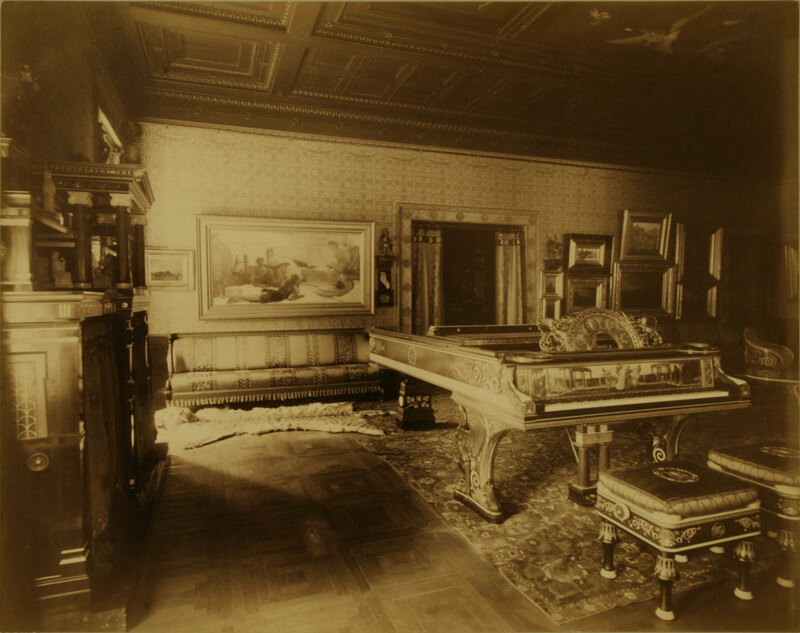 The Alma-Tadema piano in the original music room. However, here it is the piano that concerns us. And in my opinion, this is currently one of the top three most famous pianos in the world. The instrument is a Steinway D-274 (serial number 54538). 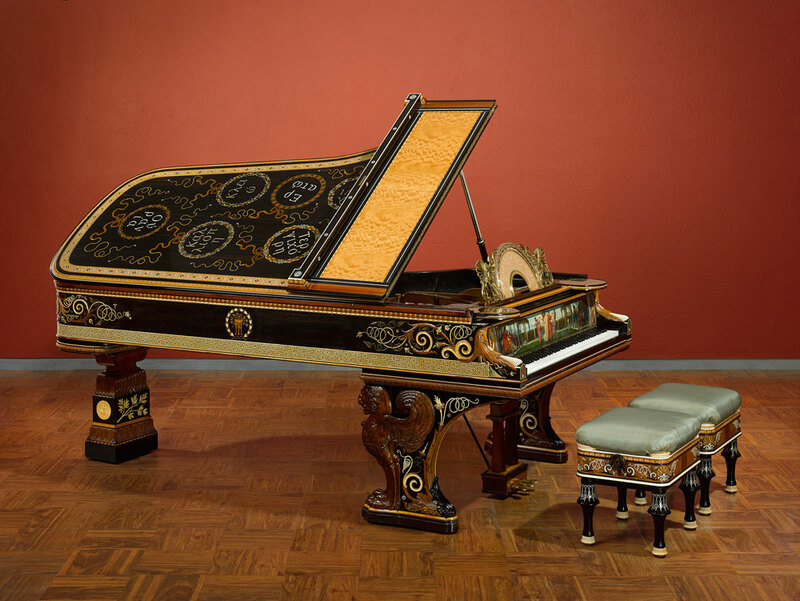 Alma-Tadema collaborated with London furniture designers Johnstone, Norman and Co. in the design of the piano. It was built between 1884 and 1887, and was to be the centrepiece of the music room. The piano is adorned with over 2000 mother-of-pearl (nacre) pieces, which embellish the exquisitely hand-carved case. Alma-Tadema commissioned Sir Edward J Poynter to paint the fallboard, which features a group of girls dancing to a band of musicians. The painting is known as “The Wandering Minstrels”. This, and the music rest are uncommonly evocative elements of this instrument. “The Wandering Minstrels” by Sir Edward J. Poynter adorns the fallboard. The names of Apollo and the Muses form inlays to the top of the lid. Inside are several parchment sheets, signed by musicians who played the instrument. Marquand died in 1902, and in 1903 the piano, and its unique stools, were sold for 8,000 dollars. The piano was displayed on the mezzanine floor of the Martin Beck Theatre in Manhattan for many years, and then in 1980 the piano was sold at auction for 360,000 dollars. In 1997 it was up for sale again, at Christie’s Auction House, London. It was purchased by The Clark for 1.2 million dollars—the most ever paid at that time for a piano at auction. Such is the importance of this instrument that Steinway created an exact replica of this piano in 2006. It has the serial number 554538, exactly half a million pianos on from the original. This facsimile is currently on display at the Tallahassee Automobile Museum (Florida). Part 3 of this ‘series’ will follow shortly and will conclude the “million dollar pianos in the news” round-up.